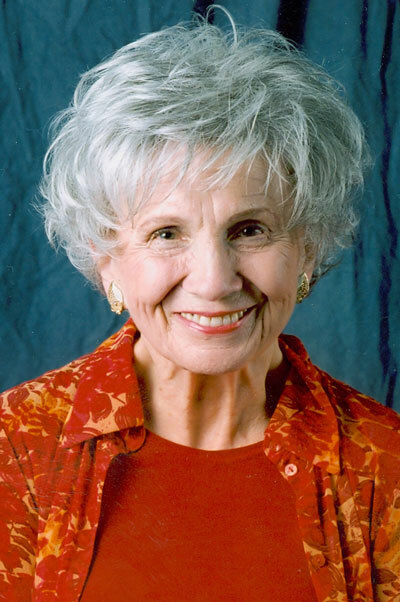 The first Canadian author to win the Nobel Prize for Literature, Alice Munro, first worked in the Vancouver Public Library prior to becoming an acclaimed short story writer and a mother. As outlined in a biography by Robert Thacker, within a month of her arrival in Vancouver in 1952 with her new husband, Jim Munro (who would eventually own and operate Munro’s Books in Victoria), Alice Munro got a part-time job at the Kitsilano branch of the Vancouver Public Library. She worked part-time for VPL until the fall of 1952, then full-time until June of 1953. After her first daughter, Sheila, was born in October of 1953, she worked part-time until her next pregnancy in 1955. LITERARY LOCATION #2: 2749 Lawson Avenue, West Vancouver. Go over the Lions Gate Bridge from Vancouver, proceed west along Marine Drive to 25th Avenue & Marine, turn right up the hill on 25th, left onto Lawson, proceed one-and-a-half blocks. During the late 1950s and early 1960s, Nobel Prize winner Alice Munro lived here with two young daughters above Dundarave village. She and her husband Jim Munro became friendly with two other couples in the area, Harry and Jessie Webb, who were bohemian artists at 2476 Bellevue Avenue, near the Dundarave pier; and editor/writers Stephen and Elsa Franklin who were planning to open the Pick-a-Pocket Bookshop at 2442 Marine Drive. The Franklins were commissioned to design the bookstore’s interior; the Munros were initially going to be partners. After the bookstore became a fixture on the same side of the street as Libby’s Drugstore, the Franklins moved east to Ontario where Elsa Franklin became the manager of Pierre Berton’s career. 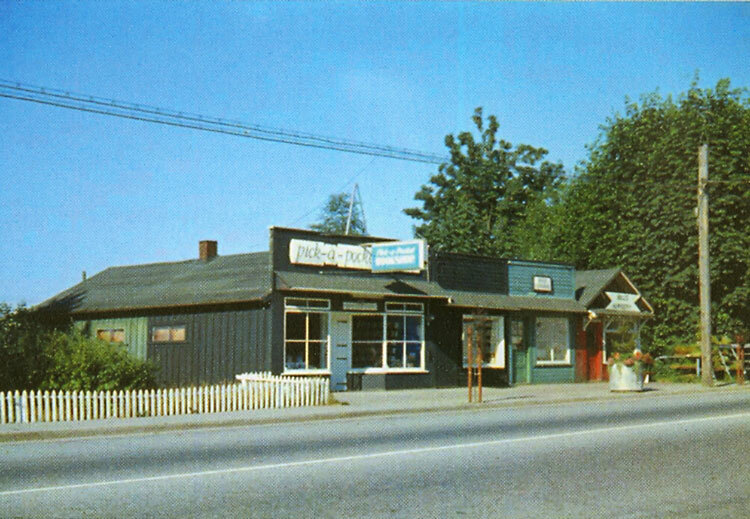 Jim Munro received the Order of Canada for operating Munro’s Books in Victoria from 1963 onward, but the initial impulse to operate a bookstore arose from Pick-a-Pocket Books in Dundarave, still a laid-back enclave where Alice Munro once briefly rented an office in order to write. Many would argue Alice Munro is the finest writer Canada has produced. In 2013 she became the first Canadian to be accorded the Nobel Prize for Literature. [Scroll down to the bottom of this entry to find her editor Doug Gibson’s excellent eyewitness account of the ceremony.] It is impossible to select one collection of her short stories as being superior to the rest. In 2005, Alice Munro accepted the 11th George Woodcock Lifetime Achievement Award for an Outstanding Literary Career in British Columbia, but most readers assume she is an Ontario writer. According to historian Eve Lazarus, at first the Munros lived in a rented house in Victoria at 105 Cook Street. In 1966, Alice Munro gave birth to her youngest daughter, Andrea, and the family bought a Tudor Revival mansion in Rockland, listed for $30,000. An offer of $20,000 was accepted. It had five fireplaces, high ceilings and a nanny’s quarters. The heritage home was reputedly built in 1894 and designed by Francis Rattenbury, but there are no records to verify it. Houseguests would include Margaret Atwood, Dorothy Livesay, Audrey Thomas and P.K. Page. In all, Alice Munro lived in Vancouver and Victoria for 22 years before her first marriage ended and she moved back to Ontario. After her divorce in 1972, Alice Munro married former university friend, Gerald Fremlin, a geographer/cartographer, in 1976. Jim Munro married textile artist Carole Sabiston in 1977, and they remained in the Rockland house. Fremlin died on April 17, 2013. Alice Munro’s dual status as a British Columbian and an Ontario resident is often overlooked. “I like the West Coast attitudes,” she said in 2004. “Winters [in B.C.] to me are sort of like a holiday. People are thinking about themselves. The way I grew up, people were thinking about duty.” One can suggest the dichotomy between duty and exploration is a fundamental friction in her stories; and the geographical disparity between unruly British Columbia and hidebound Ontario matches her character. 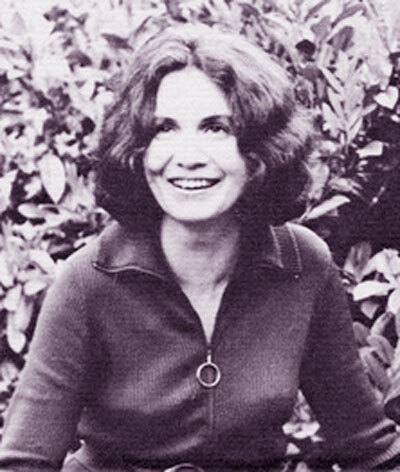 Alice Munro made her critically acclaimed debut with Dance of the Happy Shades (1968), written mostly on Cook Street. Her second book, Lives of Girls and Women (1971), was the basis for a Canadian movie. In addition, Sarah Polley adapted the story “The Bear Came Over the Mountain” for the film Away from Her (2006), starring Julie Christie and Gordon Pinsent. Most of Alice Munro’s books have been edited by Douglas Gibson, also her publisher, at Douglas Gibson Books, an imprint of McClelland & Stewart, formerly Canada’s leading publishing house for literature. Gibson lives in Toronto. With her mother’s encouragement and consent, Sheila Munro, while living in Powell River, published an astute study of their family dynamics and her mother’s books, Lives of Mothers and Daughters (2001). Winner of the 2009 Man Booker International Prize, twice winner of the Giller Prize; three times the recipient of the Governor General’s Award for Fiction, Alice Munro is peerless. In 2013 she became the first Canadian and only the thirteenth woman to be accorded the Nobel Prize for Literature. At age eighteen, Munro won a scholarship to the University of Western Ontario where she studied for two years; published her first short story, ‘The Dimensions of a Shadow’, in 1950, in Folio, an undergraduate literary magazine; and she met fellow student Jim Munro. They married in December of 1951 and moved to Vancouver where their two eldest daughters were born. Another daughter died of kidney failure on the day she was born. In Vancouver Alice Munro befriended Margaret Laurence, another housewife who was learning to write, and she was inspired by the success of local novelist Ethel Wilson, who she also met. Encouraged by her first husband to pursue her writing when they resided in West Vancouver, Alice Munro once rented a small office for herself in Dundarave, which became the basis of a story about a female writer being unable to escape the role of caring for others. As a mother, Munro has been described by one of her daughters as more of a watcher than a nurturer. In Victoria, where a fourth daughter was born, she helped establish Munro’s Books, opened in 1963, now generally considered one of the finest independent bookstores in Canada, and she gave birth to her youngest daughter in 1966. She resided in Vancouver and Victoria for 22 years before her first marriage ended and she moved back to Ontario. Alice Munro married Fremlin after she was divorced in 1976, the year she received her first honorary doctorate (having been unable to finish university due to lack of funds). For many years Alice Munro divided her time between residences in Clinton in Ontario and Comox on Vancouver Island. Encouraged by CBC’s Radio’s Robert Weaver since 1951, Alice Munro sold her first short story to Mayfair magazine in 1953. “I never intended to be a short-story writer,” Munro once said. She has suggested she might have opted for the short story approach to fiction because she was balancing her duties as the mother of three children, but she also spent many of her formative years as writer trying to write a novel without success. Alice Munro’s first short story collection, Dance of the Happy Shades (1968), received the Governor General’s Award for Fiction. Munro’s work has received many literary prizes, including three Governor General’s Awards, the Giller Prize, a Canada Council Molson’s Prize, the National Book Critics Circle Prize, the first Canada-Australia Literary Prize and the first Marian Engel Award. She is the first Canadian to receive the PEN/Malamud Award for Excellence in Short Fiction and the Rea Award for lifetime achievement in short stories. Alice Munro’s Runaway (2004) has eight stories that reflect her dual hometowns of Comox and Clinton. More than one reviewer has suggested it’s impossible to characterize the subject matter of Runaway because Munro’s beguiling stories are so multi-layered and diverse, but she has herself noted, “what I wanted to do in this book was take these sharp turns in people’s lives.” Three linked tales follow Juliet, a young teacher who visits her fisherman lover’s home the day after his wife’s funeral. In the title story, Munro keeps the reader guessing as to how a white goat’s disappearances relates to a couple’s unraveling relationship. The final story covers almost a lifetime in its 65 pages. The collection earned Munro her second Giller Prize and numerous other awards. In the early 1990s Alice Munro began spending her winters in Comox, on Vancouver Island, keeping a low profile. Her daughter Sheila Munro published an astute and revealing autobiographical and critical study of their family relationship and her mother’s books, Lives of Mothers and Daughters (2001), with Alice Munro’s encouragement and consent. [See Sheila Munro entry] An authorized and respectful biography by Robert Thacker appeared four years later. Lives of Girls and Women was the basis for a Canadian movie that featured Munro’s daughter Jenny as the heroine Del Jordan. A short film adaptation of her story ‘Boys and Girls’ won an Oscar in 1984. Sarah Polley’s superb cinematic adaptation of Alice Munro’s story ‘The Bear Came Over the Mountain,’ renamed Away from Her and starring Julie Christie and Gordon Pinsent, was nominated for an Academy Award for Best Adapted Screenplay. In one of the more believable stories in Too Much Happiness, entitled ‘Fiction,’ a graduate of UBC Creative Writing department has published her first collection of stories called How Are We To Live. The protagonist, Joyce, is an older woman who once gave this girl music lessons as a child. She has realized this up’-n’-coming writer is the daughter of the woman to whom she lost her first husband when they were all living at place called Rough River, decades before. This is about as scathing as Alice Munro gets. The self-satisfied young author has simply reiterated reality without going to trouble of fictionalizing it, adding nuances of her own. This writer “sits there and writes her name as if that is all the writing she could be responsible for in this world.” Then there is a line break. An open space on the page. A reprieve. The once-jilted Joyce, since remarried to a 65-year-old neuropsychologist, has left the book signing. And Alice Munro adds a final paragraph. SELECTED AWARDS: International Man Booker Prize, Governor General’s Award (3), PEN/Malamud Award for Excellence in Short Fiction, Giller Prize (2), The Rogers Writers’ Trust Fiction Prize, W.H. 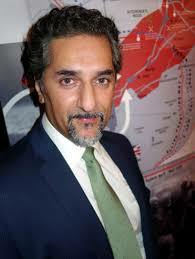 Smith Prize in the U.K., National Book Circle Critics Award in the U.S., Trillium Prize, Molson’s Prize, Libris Award, Rea Award for Lifetime Achievement, Terasen Lifetime Achievement Award (renamed George Woodcock Lifetime Achievement Award). Harbourfront Prize, 2013. Nobel Prize for Literature, 2013. Munro, Sheila. Lives of Mothers and Daughters (M&S, 2001). Thacker, Robert. Alice Munro: Writing her Lives (M&S, 2005). Probable Fictions: Alice Munro’s Narrative Acts, ed. by Louis K. Mackendrick (1981); Controlling the Uncontrollable: The Fiction of Alice Munro by Ildiko De Papp Carrington (1989); Dance of the Sexes: Art and Gender in the Fiction of Alice Munro by Beverly Rasporich (1990); Alice Munro: A Double Life by Catherine Ross (1992); The Tumble of Reason: Alice Munro’s Discourse of Absence by Ajay Heble (1994); The Influence of Painting on Five Canadian Writers by John Cooke (1996); Alice Munro by Coral Ann Howells (1998); The Rest of the Story: Critical Essays on Alice Munro, ed. by Robert Thacker (1999); Reading in: Alice Munro’s Archives by Joann McCaig (2002). Reading Alice Munro, 1973-2013 by Robert Thacker (University of Calgary Press 2015). When Alice Munro resided in Clinton, Ontario, she was interviewed by Alice Munro in 1978. This interview was first published in For Openers: Conversations with 24 Canadian Writers (Harbour 1981). It was reprinted in Strong Voices: Conversations with 50 Canadian Writers (Harbour 1988). T: Your writing is like the perfect literary equivalent of a documentary movie. MUNRO: That is the way I see it. That’s the way I want it to be. T: So it’s especially alarming when Lives of Girls and Women gets removed from a reading list in an Ontario high school. Essentially all they’re objecting to is the truth. MUNRO: This has been happening in Huron County, where I live. They wanted The Diviners, Of Mice and Men and Catcher in the Rye taken off, too. They succeeded in getting The Diviners taken off. It doesn’t particularly bother me about my book because my book is going to be around in the bookstores. But the impulse behind what they are doing bothers me a great deal. There is such a total lack of appreciation of what literature is about! They feel literature is there to teach some great moral lesson. They always see literature as an influence, not as an opener of live. The lessons they want taught are those of fundamentalist Christianity and if literature doesn’t do this, it’s a harmful influence. They talk about protecting their children from these books. The whole concept of protecting eighteen-year old children from sexuality is pretty scary and pretty sad. Nobody’s being forced to read these books anyway. The news stories never mention that these books are only options. So they’re not just protecting their own children. What they’re doing is removing the books from other people’s children. T: Removing your books seems especially absurd because there’s so little preaching for any particular morality or politics. MUNRO: None at all. I couldn’t write that way if I tried. I back off my party line, even those with which I have a great deal of sympathy, once it gets hardened and insisted upon. I say to myself that’s not true all the time. That’s why I couldn’t write a straight women’s lib book to expose injustices. Everything’s so much more complicated than that. T: Which brings us to why you write. Atwood’s theory on Del Jordan in Girls and Women is that she writes as an act of redemption. How much do you think your own writing is a compensation for loss of the past? MUNRO: Redemption is a pretty strong word. My writing has become a way of dealing with life, hanging onto it by re-creation. That’s important. But it’s also a way of getting on top of experience. We all have life rushing in on us. A writer pretends, by writing about it, to have control Of course a writer actually has no more control than anybody else. T: Do you think you’ve chosen the short story form because that requires the most discipline and you come from a very restrictive background? MUNRO: That’s interesting. Nobody has suggested that before. I’ve never known why I’ve chosen the short story form. I guess in a short story you impose discipline rather soon. Things don’t get away from you. Perhaps I’m afraid of other forms where things just flow out. I have a friend who writes novels. She never touches what she’s written on the day she’s written it. She could consider it fake to go aback and rework the material. It has to be how the work flows out of her. Something about that makes me very uneasy. I could never do it. T: You’re suspicious of spontaneity? MUNRO: I suppose so. I’m not afraid spontaneity would betray me because I’ve done some fairly self exposing things. But I’m afraid it would be repetitious and boring if I wrote that way. It’s as if I must take great care over everything. Instead of splashing the colours of and trusting they will all come together, I have to know the design. T: Do ideas ever evolve into something too big for a short story? T: I thought the title story of Something I’ve Been Meaning to Tell You was a good example of that. It didn’t work because you were dealing with the lifetimes of four different characters. MUNRO: You know I really wanted to write a novel of that story. Then it just sort of boiled down like maple syrup. All I had left was that story. For me it would have been daring to stretch that material out into a full novel. I wouldn’t be sure of it. I wouldn’t be sure it had the strength. So I don’t take that chance. T: Do you write your stories primarily for magazines now, or for eventual inclusion in a book? MUNRO: Writing for magazines is a very sideline thing. It’s what enables me to survive financially, but it isn’t important to me artistically. Right now I’m working on some stories and I might not be able to sell any of them. This has happened to very established writers. Markets are always changing. They say to begin writers study the market. That’s no use at all. The only thing you can do is write what you want. T: You once said that the emotional realism of your work is solidly autobiographical. Is that how your stories get started? When something triggers you back to an emotional experience? MUNRO: Yes. Some incident that might have happened to me or to somebody else. It doesn’t matter which. As long as it’s getting at some kind of emotional core that I want to investigate. T: Do ever worry that goldmine of your past will dry up? MUNRO: I never know. I never know. I thought I had used it all up before I started this book. Now I’m writing out of a different period. I’m very interested in my young adulthood. T: Has there been a lot of correlation between your writing and raising your daughters? MUNRO: Tremendously. When I was writing Lives of Girls and Women, some of the things in there came from things my daughters did when they were ten or eleven. It’s a really crazy age. they used to go to the park and hang down from their knees and scare people, pretending to be monkeys. I saw this wild, ferocious thing in them which gets dampened for most girls with puberty. Now my two older girls are twenty-five and twenty-one and they’re making me remember new things. Though they live lives so different from any life possible to me, there’s still similarities. T: Do you feel a great weight has been lifted now your kids are older? MUNRO: Yes. I’m definitely freer. But not to be looking after somebody is a strange feeling. All my life I’ve been doing it. Now I feel enormous guilt that I’m not responsible for anybody. T: Maybe guilt is the great Canadian theme. Marian Engel wrote Canada is “a country that cannot be modern without guilt.” And Margaret Laurence said she came from “people who feel guilty at the drop of a hat, for whom virtue only arises from work.” Since intellectual work is not regarded by many people as real work, did you face any guilt about wanting to write? MUNRO: Oh, yes. But it wasn’t guilt so much as embarrassment. I was doing something I couldn’t explain or justify. Then after a while I got used to being in that position. That’s maybe the reason I don’t want to go on living in Huron County. I notice when I move out and go to Toronto, I feel like an ordinary person. T: Do you know where you got your ambition to write? MUNRO: It was the only thing I ever wanted to do. I just kept on trying. I guess what happens when you’re young has a great deal to do with it. Isolation, feelings of power that don’t get out in a normal way, and maybe coping with unusual situations…most writers seem to have backgrounds like that. T: When the kids play I Spy in your stories, they have a hard time finding colours. Was your upbringing really that bleak? MUNRO: Fairly. I was a small child in the Depression. What happens at the school in the book you’re referring to is true. Nothing is invented. T: So you really did take a temperance pledge in the seventh grade? T: Sounds pretty bleak to me! MUNRO: I thought my life was interesting! There was always a great sense of adventure, mainly because there were so many fights. Life was fairly dangerous. I lived in an area like West Hanratty in Who Do You Think You Are? We lived outside the whole social structure because we didn’t live in the town and we didn’t live in the country. We lived in this kind of little ghetto where all the bootleggers and prostitutes and hangers-on lived. Those were the people I knew. It was a community of outcasts. I had that feeling about myself. When I was about twelve, my mother got Parkinson’s disease. It’s an incurable, slowly deteriorating illness which probably gave me a great sense of fatality. Of things not going well. But I wouldn’t say I was unhappy. I didn’t belong to any nice middle class so I got to know more types of kids. It didn’t seem bleak to me at the time. It seemed full of interest. MUNRO: That’s the getting everything-down compulsion. T: Yet your work never reads like it’s therapy writing. MUNRO: No, I don’t write just out of problems. I wrote even before I had problems! T: I understand you’ve married again. And that it’s quite successful. MUNRO: It’s a very happy relationship. I haven’t really dealt much with happy relationships. Writers don’t. They tell you about their tragedies. Happiness is a very hard thing to write about. You deal with it more often as a bubble that’s about to burst. T: You have a quote about Rose in Who Do You Think You Are. ?, “She thought how love removes the world.” With your writing you’re trying to get in touch with the world as much as possible, so does this mean that love and writing are adversaries? MUNRO: Wordsworth said, “Poetry is emotion recollected in tranquillity.” You can follow from this that a constant state of emotion would be hostile to the writing state. T: If you’re a writer, that could have some pretty heavy implications. MUNRO: Very heavy. If you’re a writer, probably there’s something in you that makes you value your self, your own objectivity, so much that you can’t stand to be under the sway of another person. But then some people might say that writing is an escape, too. I think we all make choices about whether we want to spend our lives in emotional states. T: That’s interesting. My wife’s comment on Who Do You Think You Are? was that your character Rose is never allowed to get anything. She’s always unfulfilled. Maybe she’s just wary of emotion. MUNRO: She gets something. She gets herself. She doesn’t get the obvious things, the things she thinks she wants. Like in “Mischief,” which is about middle-aged infidelity, Rose really doesn’t want that love affair. What she does get is a way out of her marriage. She gets a knowledge of herself. T: But only after a male decides the outcome of the relationship. MUNRO: I see that as true in relations between men and women. Men seem to have more initiative to decide whether things happen or don’t happen. In this specific area women have had a lack of power, although it’s slowly changing. T: When you write, “outrageous writers may bounce from one blessing to another nowadays, bewildered, as permissively raised children are said to be, by excess of approval,” I get the feeling you could just as easily substitute the word male for outrageous. MUNRO: I think it’s still possible for men in public to be outrageous in ways that it’s not possible for women to be. It still seems to be true that no matter what a man does, there are women who will be in love with him. It’s not true the other way round. I think achievement and ability are positively attractive qualities in men that will overcome all kinds of behaviour and looks, but I don’t think the same is true for women. A falling-down-drunk poet may have great power because he has talent. But I don’t think men are attracted to women for these reasons. If they are attracted to talent, it has to be combined with the traditionally attractive female qualities. If a woman comes on shouting and drinking and carrying on, she won’t be forgiven. T: Whenever I ask writers about growing older, they not only answer the question, they respond to the question. I suspect you’re enjoying getting older, too. MUNRO: Yes. Yes. I think it’s great. You just stop worrying about a lot of things you used to worry about. You get things in perspective. Since I turned forty I’ve been happier than ever before. I feel so much freer. Alice Munro briefly rented an office to write in at the the Pick-a-Pocket Bookshop, 1962. Photo by Jessie Webb. Alice Munro has a strong claim to being the best fiction writer now working in North America, but outside of Canada, where her books are No. 1 best sellers, she has never had a large readership. At the risk of sounding like a pleader on behalf of yet another underappreciated writer — and maybe you’ve learned to recognize and evade these pleas? The same way you’ve learned not to open bulk mail from certain charities? Please give generously to Dawn Powell? Your contribution of just 15 minutes a week can help assure Joseph Roth of his rightful place in the modern canon? — I want to circle around Munro’s latest marvel of a book, ”Runaway,” by taking some guesses at why her excellence so dismayingly exceeds her fame. 3. She doesn’t give her books grand titles like ”Canadian Pastoral,” ”Canadian Psycho,” ”Purple Canada,” ”In Canada” or ”The Plot Against Canada.” Also, she refuses to render vital dramatic moments in convenient discursive summary. Also, her rhetorical restraint and her excellent ear for dialogue and her almost pathological empathy for her characters have the costly effect of obscuring her authorial ego for many pages at a stretch. Also, her jacket photos show her smiling pleasantly, as if the reader were a friend, rather than wearing the kind of woeful scowl that signifies really serious literary intent. 4. The Swedish Royal Academy is taking a firm stand. Evidently, the feeling in Stockholm is that too many Canadians and too many pure short-story writers have already been given the Nobel. Enough is enough! 5. Munro writes fiction, and fiction is harder to review than nonfiction. Here’s Bill Clinton, he’s written a book about himself, and how interesting. How interesting. The author himself is interesting — can there be a better qualification for writing a book about Bill Clinton than actually being Bill Clinton? — and then, too, everybody has an opinion about Bill Clinton and wonders what Bill Clinton says and doesn’t say in his new book about himself, and how Bill Clinton spins this and refutes that, and before you know it the review has practically written itself. But who is Alice Munro? She is the remote provider of intensely pleasurable private experiences. And since I’m not interested in reviewing her new book’s marketing campaign or in being entertainingly snarky at her expense, and since I’m reluctant to talk about the concrete meaning of her new work, because this is difficult to do without revealing too much plot, I’m probably better off just serving up a nice quote for Alfred A. Knopf to pull — ”Munro has a strong claim to being the best fiction writer now working in North America. ‘Runaway’ is a marvel” — and suggesting to the Book Review’s editors that they run the biggest possible photograph of Munro in the most prominent of places, plus a few smaller photos of mildly prurient interest (her kitchen? her children?) and maybe a quote from one of her rare interviews — ”Because there is this kind of exhaustion and bewilderment when you look at your work. . . . All you really have left is the thing you’re working on now. And so you’re much more thinly clothed. You’re like somebody out in a little shirt or something, which is just the work you’re doing now and the strange identification with everything you’ve done before. And this probably is why I don’t take any public role as a writer. Because I can’t see myself doing that except as a gigantic fraud” — and just leave it at that. 6. Because, worse yet, Munro is a pure short-story writer. And with short stories the challenge to reviewers is even more extreme. Is there a story in all of world literature whose appeal can survive the typical synopsis? (A chance meeting on a boardwalk in Yalta brings together a bored husband and a lady with a little dog. . . . A small town’s annual lottery is revealed to serve a rather surprising purpose. . . . A middle-aged Dubliner leaves a party and reflects on life and love. . . .) Oprah Winfrey will not touch story collections. Discussing them is so challenging, indeed, that one can almost forgive this Book Review’s former editor, Charles McGrath, for his recent comparison of young short-story writers to ”people who learn golf by never venturing onto a golf course but instead practicing at a driving range.” The real game being, by this analogy, the novel. McGrath’s prejudice is shared by nearly all commercial publishers, for whom a story collection is, most frequently, the distasteful front-end write-off in a two-book deal whose back end is contractually forbidden to be another story collection. And yet, despite the short story’s Cinderella status, or maybe because of it, a high percentage of the most exciting fiction written in the last 25 years — the stuff I immediately mention if somebody asks me what’s terrific — has been short fiction. There’s the Great One herself, naturally. There’s also Lydia Davis, David Means, George Saunders, Lorrie Moore, Amy Hempel and the late Raymond Carver — all of them pure or nearly pure short-story writers — and then a larger group of writers who have achievements in multiple genres (John Updike, Joy Williams, David Foster Wallace, Joyce Carol Oates, Denis Johnson, Ann Beattie, William T. Vollmann, Tobias Wolff, Annie Proulx, Michael Chabon, Tom Drury, the late Andre Dubus) but who seem to me most at home, most undilutedly themselves, in their shorter work. There are also, to be sure, some very fine pure novelists. But when I close my eyes and think about literature in recent decades, I see a twilight landscape in which many of the most inviting lights, the sites that beckon me to return for a visit, are shed by particular short stories I’ve read. I like stories because they leave the writer no place to hide. There’s no yakking your way out of trouble; I’m going to be reaching the last page in a matter of minutes, and if you’ve got nothing to say I’m going to know it. I like stories because they’re usually set in the present or in living memory; the genre seems to resist the historical impulse that makes so many contemporary novels feel fugitive or cadaverous. I like stories because it takes the best kind of talent to invent fresh characters and situations while telling the same story over and over. All fiction writers suffer from the condition of having nothing new to say, but story writers are the ones most abjectly prone to this condition. There is, again, no hiding. The craftiest old dogs, like Munro and William Trevor, don’t even try. HERE’S the story that Munro keeps telling: A bright, sexually avid girl grows up in rural Ontario without much money, her mother is sickly or dead, her father is a schoolteacher whose second wife is problematic, and the girl, as soon as she can, escapes from the hinterland by way of a scholarship or some decisive self-interested act. She marries young, moves to British Columbia, raises kids, and is far from blameless in the breakup of her marriage. She may have success as an actress or a writer or a TV personality; she has romantic adventures. When, inevitably, she returns to Ontario, she finds the landscape of her youth unsettlingly altered. Although she was the one who abandoned the place, it’s a great blow to her narcissism that she isn’t warmly welcomed back — that the world of her youth, with its older-fashioned manners and mores, now sits in judgment on the modern choices she has made. Simply by trying to survive as a whole and independent person, she has incurred painful losses and dislocations; she has caused harm. And that’s pretty much it. That’s the little stream that’s been feeding Munro’s work for better than 50 years. 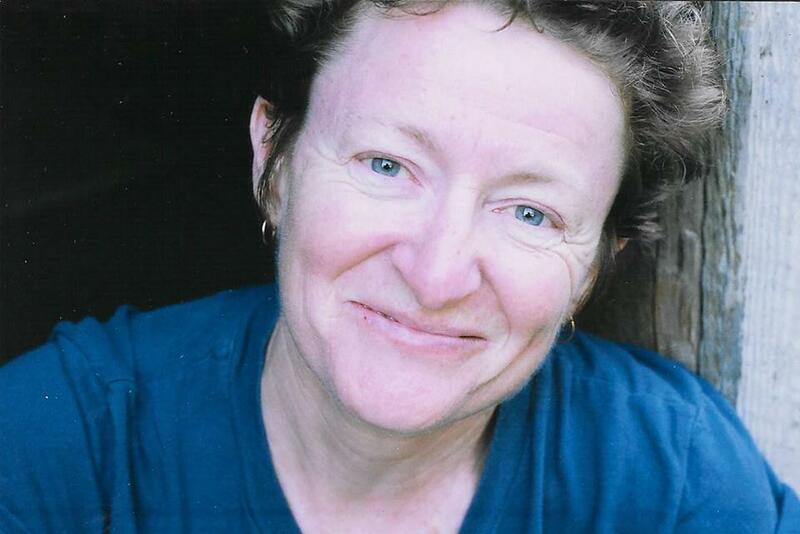 The same elements recur and recur like Clare Quilty. What makes Munro’s growth as an artist so crisply and breathtakingly visible — throughout the ”Selected Stories” and even more so in her three latest books — is precisely the familiarity of her materials. Look what she can do with nothing but her own small story; the more she returns to it, the more she finds. This is not a golfer on a practice tee. This is a gymnast in a plain black leotard, alone on a bare floor, outperforming all the novelists with their flashy costumes and whips and elephants and tigers. SHE was stating the fundamental axiom of literature, the core of its appeal. And, for whatever reason — the fragmentation of my reading time, the distractions and atomizations of contemporary life or, perhaps, a genuine paucity of compelling novels — I find that when I’m in need of a hit of real writing, a good stiff drink of paradox and complexity, I’m likeliest to encounter it in short fiction. Besides ”Runaway,” the most compelling contemporary fiction I’ve read in recent months has been Wallace’s stories in ”Oblivion” and a stunner of a collection by the British writer Helen Simpson. Simpson’s book, a series of comic shrieks on the subject of modern motherhood, was published originally as ”Hey Yeah Right Get a Life” — a title you would think needed no improvement. But the book’s American packagers set to work improving it, and what did they come up with? ”Getting a Life.” Consider this dismal gerund the next time you hear an American publisher insisting that story collections never sell. 7. Munro’s short stories are even harder to review than other people’s short stories. More than any writer since Chekhov, Munro strives for and achieves, in each of her stories, a gestaltlike completeness in the representation of a life. She always had a genius for developing and unpacking moments of epiphany. But it’s in the three collections since ”Selected Stories” (1996) that she’s taken the really big, world-class leap and become a master of suspense. The moments she’s pursuing now aren’t moments of realization; they’re moments of fateful, irrevocable, dramatic action. And what this means for the reader is you can’t even begin to guess at a story’s meaning until you’ve followed every twist; it’s always the last page or two that switches all lights on. Meanwhile, as her narrative ambitions have grown, she’s become ever less interested in showing off. Her early work was full of big rhetoric, eccentric detail, arresting phrases. (Check out her 1977 story ”Royal Beatings.”) But as her stories have come to resemble classical tragedies in prose form, it’s not only as if she no longer has room for inessentials, it’s as if it would be actively jarring, mood-puncturing — an aesthetic and moral betrayal — for her writerly ego to intrude on the pure story. Reading Munro puts me in that state of quiet reflection in which I think about my own life: about the decisions I’ve made, the things I’ve done and haven’t done, the kind of person I am, the prospect of death. She is one of the handful of writers, some living, most dead, whom I have in mind when I say that fiction is my religion. For as long as I’m immersed in a Munro story, I am according to an entirely make-believe character the kind of solemn respect and quiet rooting interest that I accord myself in my better moments as a human being. But suspense and purity, which are a gift to the reader, present problems for the reviewer. Basically, ”Runaway” is so good that I don’t want to talk about it here. Quotation can’t do the book justice, and neither can synopsis. The way to do it justice is to read it. In fulfillment of my reviewerly duties, I would like to offer, instead, this one-sentence teaser for the last story in Munro’s previous collection, ”Hateship, Friendship, Courtship, Loveship, Marriage” (2001): A woman with early Alzheimer’s enters a care facility, and by the time her husband is allowed to visit her, after a 30-day adjustment period, she has found a ”boyfriend” among the other patients and shows no interest in the husband. This is not a bad premise for a story. But what begins to make it distinctively Munrovian is that, years ago, back in the 1960’s and 1970’s, the husband, Grant, had affair after affair with other women. It’s only now, for the first time, that the old betrayer is being betrayed. And does Grant finally come to regret those affairs? Well, no, not at all. Indeed, what he remembers from that phase of his life is ”mainly a gigantic increase in well-being.” He never felt more alive than when he was cheating on the wife, Fiona. It tears him up, of course, to visit the facility now and to see Fiona and her ”boyfriend” so openly tender with each other and so indifferent to him. But he’s even more torn up when the boyfriend’s wife removes him from the facility and takes him home. Fiona is devastated, and Grant is devastated on her behalf. And here is the trouble with a capsule summary of a Munro story. The trouble is I want to tell you what happens next. Which is that Grant goes to see the boyfriend’s wife to ask if she might take the boyfriend back to visit Fiona at the facility. And that it’s here that you realize that what you thought the story was about — all the pregnant stuff about Alzheimer’s and infidelity and late-blooming love — was actually just the setup: that the story’s great scene is between Grant and the boyfriend’s wife. And that the wife, in this scene, refuses to let her husband see Fiona. That her reasons are ostensibly practical but subterraneanly moral and spiteful. And here my attempt at capsule summary breaks down altogether, because I can’t begin to suggest the greatness of the scene if you don’t have a particular, vivid sense of the two characters and how they speak and think. The wife, Marian, is narrower-minded than Grant. She has a perfect, spotless suburban house that she won’t be able to afford if her husband returns to the facility. This house, not romance, is what matters to her. She hasn’t had the same advantages, either economic or emotional, that Grant has had, and her obvious lack of privilege occasions a passage of classic Munrovian introspection as Grant drives back to his own house. Their conversation had ”reminded him of conversations he’d had with people in his own family. His uncles, his relatives, probably even his mother, had thought the way Marian thought. They had believed that when other people did not think that way it was because they were kidding themselves — they had got too airy-fairy, or stupid, on account of their easy and protected lives or their education. They had lost touch with reality. Educated people, literary people, some rich people like Grant’s socialist in-laws had lost touch with reality. Due to an unmerited good fortune or an innate silliness. . . .
”What a jerk, she would be thinking now. I end this quotation unwillingly. I want to keep quoting, and not just little bits but whole passages, because it turns out that what my capsule summary requires, at a minimum, in order to do justice to the story — the ”things within things,” the interplay of class and morality, of desire and fidelity, of character and fate — is exactly what Munro herself has already written on the page. The only adequate summary of the text is the text itself. Which leaves me with the simple instruction that I began with: Read Munro! Read Munro! Except that I must tell you — cannot not tell you, now that I’ve started — that when Grant arrives home after his unsuccessful appeal to Marian, there’s a message from Marian on his answering machine, inviting him to a dance at the Legion hall. And this still isn’t the ending. The story is 49 pages long — the size of a whole life, in Munro’s hands — and another turn is coming. But look how many ”things within things” the author already has uncovered: Grant the loving husband, Grant the cheater, Grant the husband so loyal that he’s willing, in effect, to pimp for his wife, Grant the despiser of proper housewives, Grant the self-doubter who grants that proper housewives may be right to despise him. It’s Marian’s second phone call, however, that provides the true measure of Munro’s writerly character. To imagine this call, you can’t be too enraged with Marian’s moral strictures. Nor can you be too ashamed of Grant’s laxity. You have to forgive everybody and damn no one. Otherwise you’ll overlook the low probabilities, the odd chances, that crack a life wide open: the possibility, for example, that Marian in her loneliness might be attracted to a silly liberal man. And this is just one story. There are stories in ”Runaway” that are even better than this one — bolder, bloodier, deeper, broader — and that I’ll be happy to synopsize as soon as Munro’s next book is published. Or, but, wait, one tiny glimpse into ”Runaway”: What if the person offended by Grant’s liberality — by his godlessness, his self-indulgence, his vanity, his silliness — weren’t some unhappy stranger but Grant’s own child? A child whose judgment feels like the judgment of a whole culture, a whole country, that has lately taken to embracing absolutes? What if the great gift you’ve given your child is personal freedom, and what if the child, when she turns 21, uses this gift to turn around and say to you: your freedom makes me sick, and so do you? 8. Hatred is entertaining. The great insight of media-age extremists. How else to explain the election of so many repellent zealots, the disintegration of political civility, the ascendancy of Fox News? First the fundamentalist bin Laden gives George Bush an enormous gift of hatred, then Bush compounds that hatred through his own fanaticism, and now one half of the country believes that Bush is crusading against the Evil One while the other half (and most of the world) believes that Bush is the Evil One. There’s hardly anybody who doesn’t hate somebody now, and nobody at all whom somebody doesn’t hate. Whenever I think about politics, my pulse rate jumps as if I’m reading the last chapter of an airport thriller, as if I’m watching Game Seven of a Sox-Yankees series. It’s like entertainment-as-nightmare-as-everyday-life. She is speaking to you and to me right here, right now. Once upon a long time ago, before Time magazine called her one of the most influential people on the planet, Alice Munro, born in Ontario, worked as a clerk in the Vancouver Public Library. She wasn’t permitted to help library patrons find their books. A mother of three daughters, Munro occasionally found spare hours to scribble stories in the Kitsilano Library branch. Her new collection Too Much Happiness contains ten delectable stories that are as good as anything she has written in her long career. The collection is vintage Munro in that many of the stories are novels, covering years and lifetimes, condensed to their tasty essence. The language as always is crisp and clear, like the tinkling of bells. Reading becomes a compulsion: one has to find out what is going to happen. In ‘Deep-Holes,’ the character Sally has to deal with a son, who at age 9 falls into a deep hole and is rescued by his father. The boy becomes a strange, troubled, possibly insane adult, who disappears for years at a time. Here Munro comments on the difficulty of possessing specialized knowledge and how this era of the internet diminishes that knowledge. When her son was young they scoured books for information on obscure and isolated islands like Tristan da Cunha. Years later, wanting to brush up on those details, she thinks of the encyclopedia, but ends up on the internet where every imaginable fact about Tristan da Cunha is displayed. She no longer has secret knowledge, and feels a terrible disappointment. The story ‘Fiction,’ my favorite in this exemplary collection, deals with the question of what is fact and what is fiction, and does a writer really know where a story comes from? Or, for that matter, what a story is really about. I’m reminded of Henry James protesting that The Turn of the Screw was merely an entertainment, negating the volumes of psycho babble written about the novel. is about a home invasion. The invader, young, dangerous and slightly insane enters the home of a widow living in a semi-rural area. The story sent me running to reread Flannery O’Connor’s ‘A Good Man is Hard to Find,’ the tale of an escaped convict and his pals executing a family in the rural South. In O’Connor’s story the sense of menace is palpable, in Munro’s it is muted. ‘Free Radicals’ is more about the widow, Nita, learning about herself and what she is capable of, as she concocts a story, trying to win the invader’s trust, about committing a murder herself. Only the deus ex machina ending is a little too pat, about the only soft spot in the whole collection. ‘Child’s Play,’ the story of two very young girls at summer camp, explores the banality of evil, and how disturbing events put behind us will just never stay in their place. 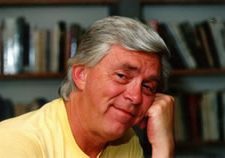 One of the reasons I retired from fiction writing in my 60s, besides feeling that I had said most of what I wanted to say, was that I have seen so many elderly writers trading on their name and turning out pitiful parodies of their former greatness: Updike and Mailer immediately come to mind. Therefore, it was a relief to find that Munro has not lost a step, and that the quality of this collection matches anything she has written in her long career. In my 40-some years on the CanLit scene, an industry rife with jealousies, feuds and petty backbiting, to which I have contributed my share, I have never heard anyone say anything unkind about Alice Munro, personally or professionally. When Alice wins a prize other writers and critics are not lined up to name ten books that should have won. 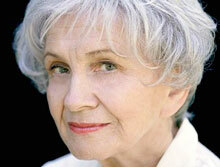 Now Alice Munro has won the prestigious Man Booker International Prize. In my opinion she and Irish writer William Trevor are the world’s finest living short fiction writers, something the Nobel Prize people might well consider. Festival on October 18. Alice Munro is scheduled to attend. Most artists end up imitating themselves. Their art degenerates into a copy of a copy of a copy. Alice Munro has remained a great artist for five decades because her stories are propelled by curiosity. Human nature (not moralism), is always the catalyst, and human nature has endless variations. Life in Alice Munro’s fiction is frequently painful and disappointing—but the reflex of humour can be a crucial antidote, as W.P. Kinsella touches upon in his review [see above]. 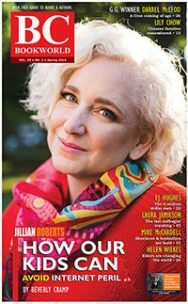 Now 78, Alice Munro raised her three daughters mostly in West Vancouver and Victoria, where her first husband Jim Munro, father of her children, still owns and operates Munro’s Books. She remains more of a West Coaster than most of her readers realize. She has always been a writer. During her acceptance of Man Booker International Prize at Trinity College in Dublin, Munro recalled being seven years old, pacing in her backyard, trying to find a way to make Hans Christian Andersen’s The Little Mermaid have a happy ending. Her new collection of stories is called Too Much Happiness (Douglas Gibson Books, M&S $32.99). Simultaneously, there is a new edition of My Best Stories (Penguin $22), with an introduction by Margaret Atwood. Alice Munro was born Alice Laidlaw in Wingham, Ontario on July 31, 1931. Her father was a farmer; her mother, a former teacher. When her mother developed Parkinson’s disease, Alice Laidlaw handled the brunt of domestic duties but nursed ambitions to become a writer. During her two years at the University of Western Ontario, she published her first short story in Folio, an undergraduate literary magazine, and met fellow student Jim Munro. They married in December of 1951 and moved to Vancouver where their two eldest daughters were born. Another daughter died of kidney failure on the day she was born. In Vancouver Alice Munro befriended Margaret Laurence, another housewife who was learning to write, and she was inspired by the success of local novelist Ethel Wilson. In Victoria, where a fourth daughter was born in 1966, she helped operate Munro’s Books (est. 1963), considered one of the finest independent bookstores in Canada. In all, Alice Munro resided in Vancouver and Victoria for 22 years before her first marriage ended and she moved back to Ontario. 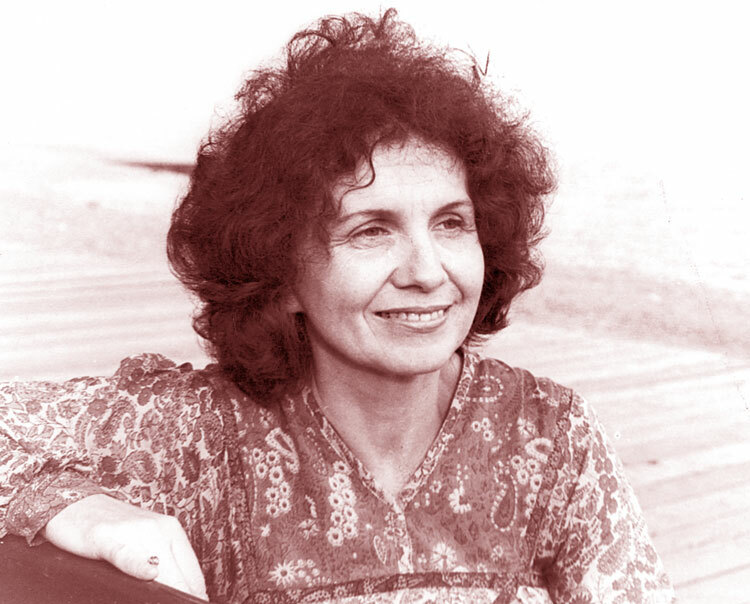 Alice Munro married Fremlin after she was divorced in 1976, the year she received her first honorary doctorate (having been unable to finish university due to lack of funds). They now divide their time between residences in Clinton in Ontario and Comox on Vancouver Island. Encouraged by CBC Radio’s Robert Weaver since 1951, Alice Munro sold her first short story to Mayfair magazine in 1953. She has suggested she might have opted for the short story approach to fiction because she was balancing her duties as the mother of three children, but she also spent many of her formative years as writer trying to write a novel without success. Alice Munro’s first short story collection, Dance of the Happy Shades (1968), received the Governor General’s Award for Fiction. Lives of Girls and Women (1971), which was marketed as a novel and received the Canadian Booksellers Award, was the basis for a Canadian movie of the same name that featured her daughter Jenny Munro as the heroine Del Jordan. Recently Sarah Polley’s superb cinematic adaptation of Alice Munro’s story The Bear Came Over the Mountain, renamed Away from Her and starring Julie Christie and Gordon Pinsent, was nominated for an Academy Award for Best Adapted Screenplay. A frequent contributor to the New Yorker since 1976, Alice Munro became the eleventh recipient of the George Woodcock Lifetime Achievement Award for B.C. writing in 2005. She accepted the award, accompanied by her daughter, BCBW contributor Sheila Munro, at the Vancouver Public Library, where she once worked. Alice Munro is only the third recipient of the new Man Booker International Prize. Part of her appeal is that her work is distinctly Canadian in a classic ‘Who Do You Think You Are?’ mold. Typically, she told her Man Booker audience in Ireland that writing, for her, has amounted to “…always fooling around with what you find. . . .
Munro doesn’t write whodunnits like Agatha Christie but she does reveal the mysteries of behaviour. Conventional thinking is never enough. The International Festival of Authors announced today that this year’s recipient of the Harbourfront Festival Prize, worth $10,000, is Alice Munro. The perennial Nobel Prize contender will be honoured with the prize for her contributions to Canada’s literary community and the next generation of talent. The prize will be awarded Nov. 2, the closing night of the festival, at a special tribute to Munro, who announced her retirement from writing in June. The evening will be hosted by Douglas Gibson, Munro’s publisher of nearly 40 years, and attended by the author’s colleagues, family, and other members of the literary community who will present readings from her work. Munro was selected for the prize by a jury consisting of Q&Q publisher Alison Jones, Toronto Star books and visual arts editor Dianne Rinehart, and IFOA director Geoffrey E. Taylor. OCTOBER 10, 2013 – The Writers’ Union of Canada is thrilled at the news today of Alice Munro being awarded the Nobel Prize for Literature. The Nobel Prize committee announced this morning that Alice Munro will receive a Nobel Medal, Nobel Diploma and a document confirming the Nobel Prize amount from King Carl XVI Gustaf of Sweden. The Nobel ceremony takes place December 10 in Stockholm, Sweden. Alice Munro has written or contributed to twenty books in her storied career, and has won a host of other prizes before today, including two Giller Prize wins, a Governor General’s Award for Fiction, and the Trillium Prize. In an industry where the novel form can dominate attention, Alice Munro has inspired several generations of writers to expand on her work in the short story form. She is, as so many others have noted, the greatest living short story artist. “Alice Munro Nobel Laureate.” Surely millions of glasses were raised to that over Thanksgiving weekend. And not just in Canada! You can bet we thousands of TWUCers did. Alice was a founding member of TWUC. She was at the planning meetings along with Graeme Gibson, Margaret Atwood, Marian and Howard Engel and others. She attended the November 3rd, 1973 Ottawa meeting when TWUC was officially founded, with Margaret Laurence as Honourary Chair, Marian Engel elected Chair. In 1980 when I attended my first TWUC meeting, I had the pleasure of sitting beside Alice. I have relatives still farming in ‘Munro country’. “That will be a lot of hard work,” said Alice in response to my remarks about revising my third novel. She has a strong work ethic. She does not write effortlessly. This is what many people will be doing now… recalling times with Alice, the influence of her work. That’s my important point. Alice Munro as Nobel Laureate will have lasting influence. People at home and abroad will regard her and Canadian literature more highly. I had an email forwarded from a university professor of Canadian Studies in England, forecasting that the Canadian government will now appreciate Canadian writing more and restore more funding for it. Scoff as some may, there is plausibility in this and TWUC will work on it. Alice has been a supportive member of The Writers’ Union of Canada for all its forty years. We thank her for that. As I said in our letter of congratulations to her, her work is much loved and so is she. The Writers’ Trust later extended its heartfelt congratulations to short fiction genius Alice Munro, winner of the 2013 Nobel Prize in Literature, by preparing a video tribute featuring authors Miriam Toews, Douglas Gibson, Alistair MacLeod, and more. Alice Munro’s editor since 1976, Doug Gibson, attended the Nobel Prize awards ceremony on December 10, 2013, at which Sweden’s King Carl XVI Gustaf presented the 2013 Nobel Prize in Literature to “Alice Munro of Canada,” accepted on her behalf by her daughter Jenny Munro. Here is Gibson’s eyewitness report that was initially printed in The National Post and reprinted by permission. It is mid-afternoon in Stockholm but the darkening streets are full of men in formal white tie and tails escorting ladies in long dresses toward the Concert Hall. They look, my wife suggests, like a convention of conductors, but although an orchestra will be involved this afternoon, it is not a musical event. It is the formal ceremony for the presentation of the Nobel Prizes, and we are part of the hurrying throng because — as, literally, all the world knows — Alice Munro is this year’s winner of the Nobel Prize for Literature. To say Alice Munro is a popular Nobel choice is a huge understatement. She is everywhere here. SVT has run a documentary, in prime time, about her. I had a modest hand in this film, having taken the Swedish crew to the Boston Church near Milton, Ont. (where the earliest Laidlaws from Scotland are buried, and where I spoke learnedly about young Alice Laidlaw and her family). Later, I took them to Wingham (where the Alice Munro Literary Garden showed up well), and to Clinton (where Alice’s local friend, Rob Bundy, took them into Alice’s house, noting how seriously they composed themselves, before entering the actual room where Alice wrote). They even posed me for an interview high above the Maitland River near Goderich as we talked about the universal appeal of Alice’s work. The subtitles in Swedish look very impressive, suggesting that I was making some degree of sense. Best of all, the crew went on to Victoria and recorded a fine interview with Alice, and her daughter Sheila. But that popular, prime-time broadcast (which has been repeated) was just one example of how omnipresent Alice Munro has been during the great flowing cocktail party of events this week. Everything starts at the legendary Grand Hotel, which has its own “Nobel Desk,” where you pick up your itinerary and tickets for the week and stagger off, amazed. On Saturday, for example, the Nobel people organized an evening in Alice’s honour at the Swedish Academy, a “Nobel Conversation with Alice Munro.” It featured a 20-minute recorded interview where Alice (in Victoria) talks about her life and work, ending with a modest, grateful statement about how much winning this award means to her. Present onstage at the Saturday event was Jenny Munro, Alice’s daughter, who has represented her mother with poise and charm throughout, and has made many friends. The constant demands on her and the constant round of interviews and other events confirm the wisdom of Alice’s regretful decision not to attend in person, and Jenny is a wonderful, gracious representative. Her great moment is the award ceremony at the Concert Hall. (Did I mention that the dramatic hall, with its memorable, sky-blue exterior, was the setting for a special Nobel Prize Concert event on Sunday night with the Italian guest conductor, Riccardo Muti?). Jenny is onstage when the white-tie audience enters, with every seat so carefully allocated that my wife and I find that passports are required to establish identity and gain entry. The setting of the stage is traditional, year after year, as the SVT Nobel Channel reveals with its film from earlier years. After the entry of the King of Sweden, and the Royal Family, the prize-giving ceremony soon becomes predictable, punctuated by surprising musical breaks. (Did she really sing I Could Have Danced All Night?). First, each Nobel laureate is formally introduced by a nominating member of the Swedish Academy. The laureate rises, then advances to the centre of the stage to receive the Nobel Prize from the hands of the King. It is a complicated manoeuvre, involving a special movement for the handshake with the King and then a three-way bow — to the King, to the sponsoring speaker, and finally to the audience, which then applauds. In Jenny’s case, two remarkable things happen. Right on cue she moves to stage centre in her elegant navy blue gown. Then, instead of the usual “congratulations, well done” brief conversation from the King, he really talks to her, at some length. Then, prepared by her rehearsal (the Swedes may be a friendly, democratic people, but they value careful formality, and the arriving crowd included some gentlemen wearing top hats) she carries off the three bows … and the applause from the audience goes on and on, even after she returns to her seat. The applause does not quite match the Harbourfront Tribute to Alice in November, where one Toronto newspaper reported that the applause went on “for several minutes,” but it is noticeably longer and warmer applause than that received by the other (very worthy) Nobel laureates. There are Canadian whoops and cheers, assisted by some American allies in our Munro group — and there are damp eyes in our party. I said earlier that Alice is hugely popular here. After a celebratory lunch at the Canadian embassy (and the bright and lively ambassador Kenneth Macartney and his wife Susan — a former employee of the Munro Bookstore in Victoria! — are keenly aware of the importance of this win for Canadian-Swedish relations), an event was arranged at the largest Stockholm bookstore for that afternoon. Alice’s Swedish publisher, her translator, a prominent reviewer and I were the attractions, but Alice was the real draw. It was standing-room only. And every bookstore in this well supplied city of great culture, many museums, and many, many readers, has mounds of her books, in Swedish and English, prominently displayed. Every window seems to have the familiar photo of silver-haired Alice in her white blouse looking out thoughtfully from her Clinton back porch at passing browsers in Stockholm. The Swedes are omnivorous readers. I spent some time with Peter Englund, the secretary of the Nobel Prize committee, telling him that his famous words, “And the winner of the 2013 Nobel Prize for Literature is … Alice Munro of Canada” made him the most popular man in Canada. He liked this news, and promised to visit us. I mentioned that I happened to know that the name Munro played a prominent part in Swedish history. During the Thirty Years War, the leader of the Protestant side was King Gustavus Adolphus of Sweden. Many of his troops were Scottish, I reminded him, and there were two Swedish generals and dozens of officers who were Scots named Munro. Did he happen to know about this historic link with the name Munro? Yes, Peter admitted, he did. In fact, one of the Munro generals was so prominent that around 1640 he wrote a military training manual, and Peter had read it! I retired from the field. I told Peter about my visit to the official Nobel outfitters to rent my white tie and tails outfit. This is a rite of passage for every male Nobel laureate (women in long gowns, for once, get off easily), and at the rental establishment, the wisest men on the planet, and hangers-on like me, are to be seen shuffling around in their underwear. On the big day itself, the Grand Hotel stations a squad of flying butlers in the lobby to help the despairing laureates who troop off the elevator saying, “I can’t get the buttons on this stiff shirt-front to close!” or, “My white bow tie won’t stay tied!” Even Peter Higgs, the Scottish Nobel laureate in physics, confessed to me that the shirt buttons posed a major problem for him, despite his deep theoretical knowledge of physical properties. The reflected glory of my link to Alice was demonstrated in that same conversation with Englund, when I mentioned that on my clothes rental trip I had dropped in to the Swedish National Library building, and been very impressed. “Ah,” Peter responded. “But did you introduce yourself?” No, of course not. He was disappointed. But can you imagine any other city in the world where the announcement: “I am Alice Munro’s Canadian editor” would have produced a positive response? Stockholm, in that sense, is very close to Wingham, and Clinton and Goderich. But perhaps the final proof of Alice Munro’s hold on this city came two days after the awards ceremony. The Royal Dramatic Theatre, where Ingmar Bergman ruled for so many years, is a great, ornate downtown theatre, similar to Toronto’s Royal Alexandra Theatre. The Thursday evening show there was devoted to a dozen actors (and Jenny Munro) reading from her work. In Swedish. On a bare stage. Only two bouquets of flowers set off the line of static chairs on which the actors sat, before taking their turn at the reading microphone. Alice Munro’s silver-haired Clinton photo is blown up to fill the whole back-drop. Occasionally it is replaced briefly by a photo of the Goderich Harbour, or a snowy Huron County scene. But as a drama, the whole attraction is in the words. And all 800 seats are sold out, as the people of Stockholm flood in to hear the words of Alice Munro. Their Alice Munro.